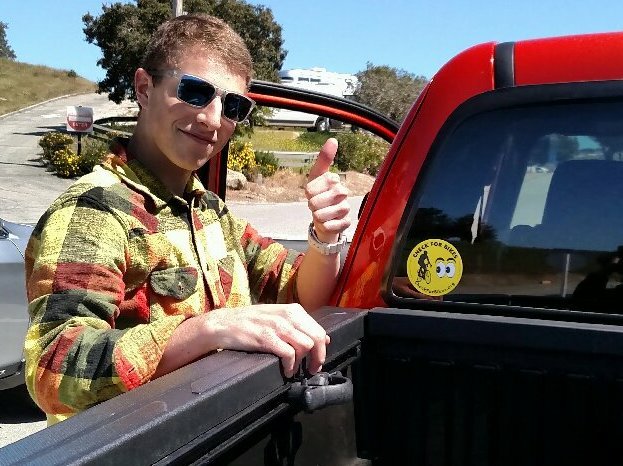 Everyone loves ’em on their car or truck rear window! 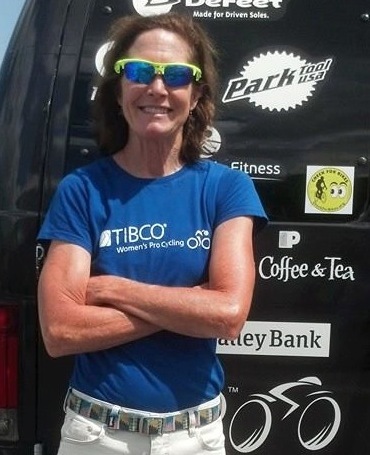 WANT TO PROMOTE DRIVING SAFELY AND SAFE CYCLING FROM THE OUTSIDE, TOO? WE NOW HAVE STICKERS FOR YOU, AND CAN CUSTOMIZE THEM, TOO!! Put ’em on your helmet, trailer, toddler seat, computer, notebook, bicycle, motorcycle, scooter – wherever something will stick – yes, even your car bumper – to send the message to the world to Check For Bikes! We now have die-cut Bumper Stickers of the Universal “Check for Bikes,” the Universal Spanish & the Youth images – contact us or order through our order page to get some now! 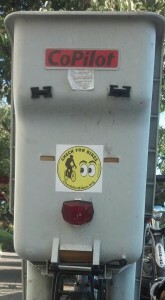 Where else can you enhance bike safety for a few bucks?! Ask us about our Combo Packs, too! Pick up these bumper stickers and put on a helmet or anywhere else to remind people to CHECK FOR BIKES! ¿Hablas Español? Know someone who does? 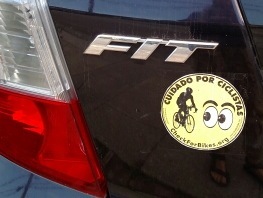 Pick up some of these “Check for Bikes” clings and bumper stickers in Spanish! 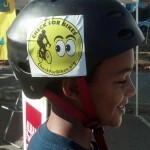 A bike’s child seat is the perfect place to put a “Check for Bikes” bumper sticker! Founder of professional cycling Team TIBCO, Linda Jackson, put a “Check for Bikes” sticker on their team vehicle! Contact us at contact@checkforbikes.org to order these and/or have us design customized ones for you! 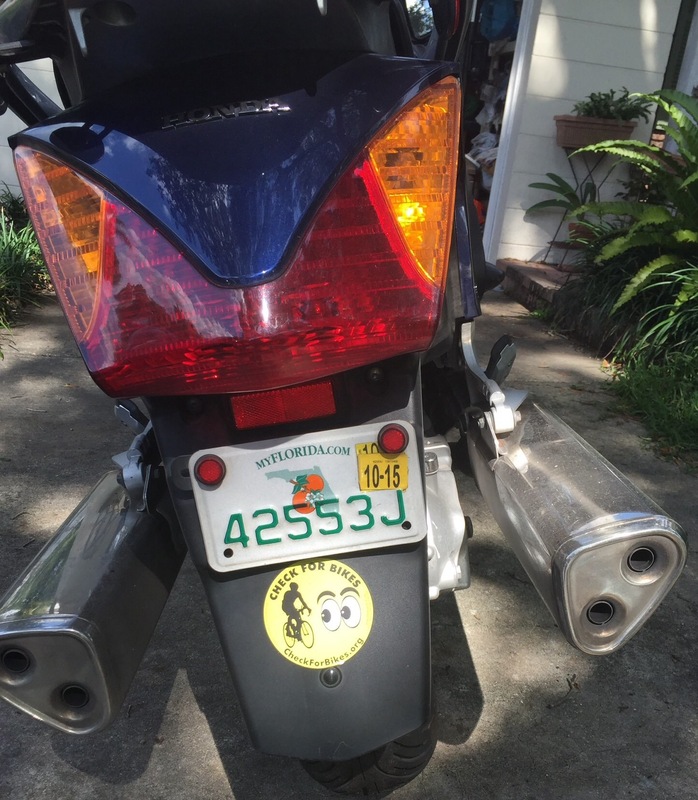 They do double duty on a motorcycle, reminding people to look out for everyone on two wheels. Missing Link Bicycle Cooperative in Berkeley just received their order for their own customized “Check for Bikes” bumper stickers! 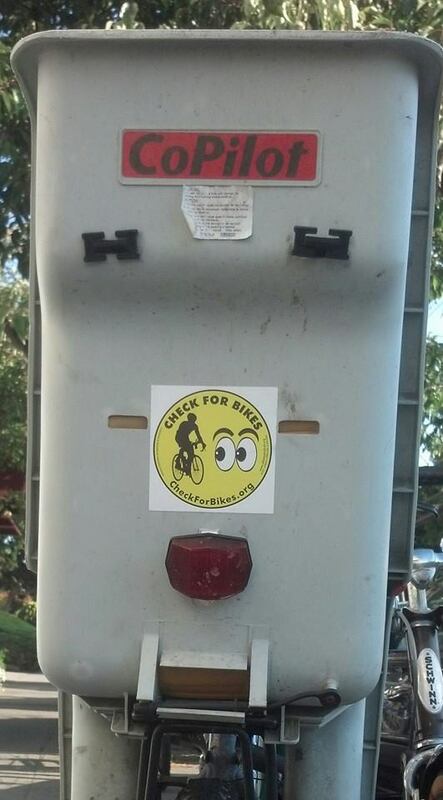 I’m sure you’ll be seeing them around town, reminding all drivers to check for bicyclists!